The South China Sea will shape the course of the 21st century. Brunei, China, Malaysia, the Philippines, Taiwan, and Vietnam have each claimed part of the resource-rich region, and have drawn upon centuries of history to justify their claims. These overlapping claims have created friction between these countries, and the ongoing competition to control the South China Sea has erupted in armed clashes between militaries, coast guard fleets, and fishing vessels in the past. The South China Sea disputes have intensified in recent years, as the claimants have stepped up efforts to assert control of the region, including building and militarizing artificial islands. China in particular has been notably aggressive in this regard. These actions will have far-reaching impacts. The South China Sea is a critical region for the global economy. Over US $5 trillion in trade passes through the region each year, on trade routes that connect Asian markets to the world. Click here to read Senator Ngo’s speech introducing the motion on May 17, 2016. Click here to listen to the speech, or click here to listen to the speech with simultaneous English translation. Click here to read Senator Ngo’s speech on a related inquiry calling the attention of the Senate to China’s hostile behaviour in the South China Sea disputes on March 8, 2016. Click here to listen to the speech, or click here to listen to the speech with simultaneous English translation. This report, released by Senator Ngo’s office, aims to provide information on the South China Sea disputes. Several aspects of the disputes are addressed, including the existing international law that governs maritime claim disputes, the international reaction to the South China Sea disputes, their impacts on the environment and the global economy, and Canada’s current policy on the disputes. An overview of each South China Sea country’s position and a detailed timeline of the disputes is included. 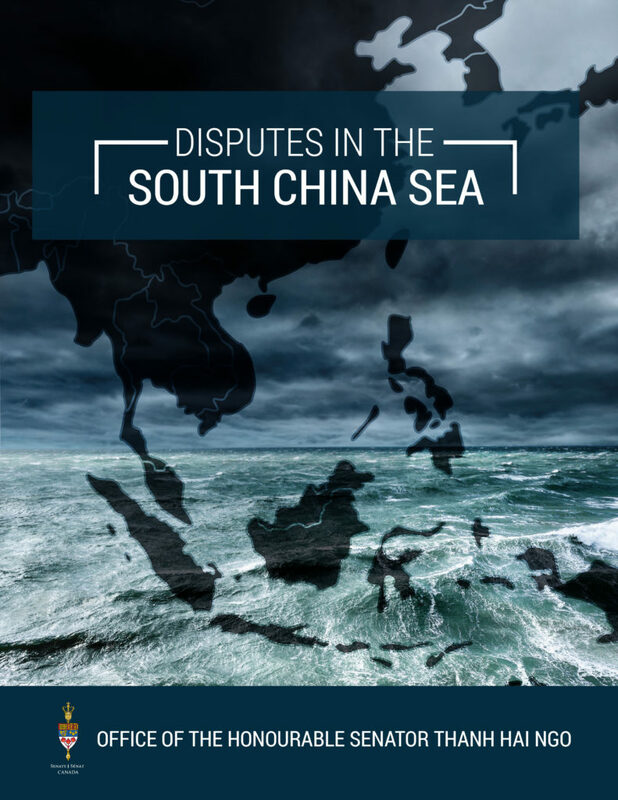 Click on the cover to view and download an English version of the position paper on the Disputes in the South China Sea.